Recent years have produced many memorable moments in college basketball, especially when it comes to upsets. We turned to our staff to figure out the 10 best of the last decade. Everyone loves a good upset. They’re what make college basketball so great—the idea that anyone can beat anyone else on a given night. If Virginia and UMBC had played 10 times last March, the Cavaliers may have won nine, but it didn't matter. The Retrievers got one chance and took their best shot, checking off the final unchecked box of possible NCAA tournament first round results: a No. 16 seed beating a No. 1. And with it, they became college basketball legends, instantly putting their school on the map and forever etching UMBC’s name in the history books. All upsets have a general feeling of David vs. Goliath, but David doesn’t always come in the form of the scrappy mid-major getting a rare turn in the national spotlight in the tournament. And while March is the ultimate breeding ground for producing this kind of result, it doesn’t take the chaos of the NCAA tournament to produce a memorable upset. Just ask Division II Le Moyne, which made the 15-minute drive over to the Carrier Dome for an exhibition in November 2009 and shocked a preseason-ranked Syracuse team on its home floor. That game never officially cost the Orange anything, but it still lives on. We asked SI’s college basketball staff to rank their top 10 upsets, men's or women's, of the last decade (starting with the 2008–09 season), averaged the results based on a weighted ranking and produced the list below, plus some honorable mentions. One thing we all agree on: There was no lack of choices. You probably don’t need much of a refresher on this one. No. 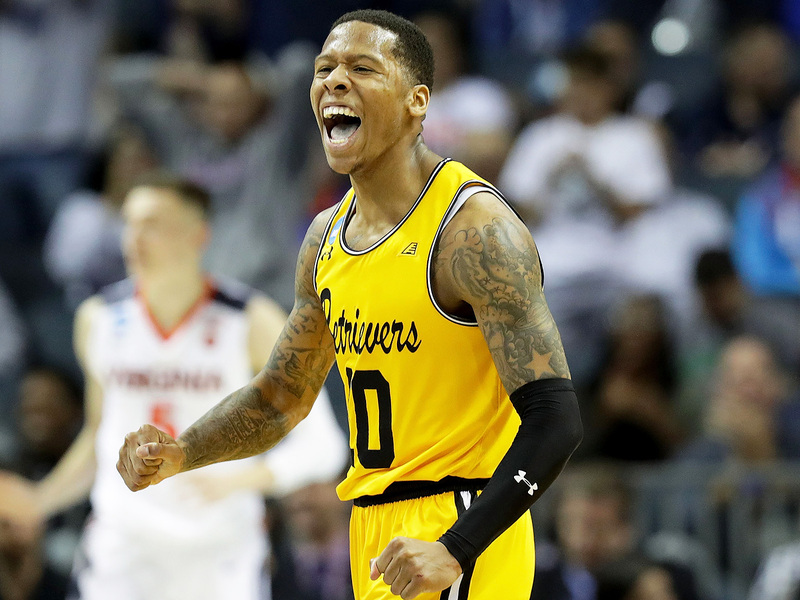 16 seed UMBC’s 74–54 win over the 2018 tournament’s No. 1 overall seed, Virginia, is one of the greatest upsets in sports history; one of those moments where everyone watching knew they were viewing something extraordinary. Many felt that it was only a matter of time before some elite team had enough of an off night that a No. 16 seed playing out of its mind could squeak by. Only the Retrievers didn’t squeak by—they dominated. This game needed no buzzer beater, no last-minute heroics, no one play that altered history. After the teams played to a 21–21 first half, UMBC quickly stepped on the Cavaliers’ throats in the second, allowing the audience to slowly grasp that yes, this was really happening. UVA’s defense-first style of play made it especially hard to stage a rally, and every second-half three that the Retrievers drained felt like another dagger. If the night wasn’t already improbable enough, it was quickly revealed afterward that the parents of Jairus Lyles, who poured in 23 of his 28 points in that fateful final 20 minutes, are both Virginia grads. We’re guessing this is one game they didn’t mind their alma mater losing. Before Arike Ogunbowale and Notre Dame did it in dramatic fashion this past March, UConn suffered a similarly dramatic tournament departure at the hands of Mississippi State one year prior. Morgan William’s tie-breaking jumper in overtime of the national semifinals beat the buzzer, giving the No. 2 seed Bulldogs a 66–64 win and ending an astounding 111-game winning streak by the Huskies, the longest ever in college basketball. “One of the great upsets in history,” said announcer Dave O’Brien as Mississippi State swarmed William in celebration. Even Geno Auriemma managed a small smile and nod at Bulldogs coach Vic Schaefer as they went to shake hands in the aftermath, seemingly realizing the gravity of what Schaefer’s team just accomplished. UConn would go on to win its first 36 games of the 2017–18 season before being stunned by the Irish, ending an incredible 147–1 run across four seasons in which the only team to beat it was those Mississippi State Bulldogs. Four of the eight times a No. 15 seed has defeated a No. 2 seed in the NCAA tournament have come in the last five seasons. All were shocking, of course, but no one in that quartet may have busted brackets as much as the Blue Raiders did in their 90–81 win in the 2016 opening round. Going into the Big Dance, many felt that Michigan State, which closed the regular season and Big Ten tourney by winning 13 of 14 games, was actually under-seeded at No. 2. The public had great faith in the Spartans making a deep run—between ESPN, Yahoo and CBS Sports’s bracket challenges, nearly one-quarter of entries had them winning the national championship—making it all the more stunning when they were knocked out in the first round. Instead, Reggie Upshaw, Giddy Potts and their teammates had other ideas, putting on an offensive clinic and introducing themselves to America. Middle Tennessee State’s 90 points marked its second-highest point total all season, and it just happened to come against one of the country’s top teams. MTSU’s season would end two days later at the hands of Syracuse, but it will always own one of the most impressive March surprises. Who can forget Dunk City? The Eagles took the nation by storm in March 2013 with their high-flying ways, becoming the first (and still only) No. 15 seed to make the Sweet 16. It was the school’s first-ever NCAA tournament appearance, having only become a full Division I program less than two years prior. Under coach Andy Enfield, who would take the USC job just days after his team’s run was ended by Florida, Florida Gulf Coast would stun No. 2 seed Georgetown in the opening round, winning 78–68 on the back of Sherwood Brown and Bernard Thompson, who combined for 47 points. FGCU would go on to beat No. 7 San Diego State as well, ensuring its feat—and its thunderous dunks—would not soon be forgotten. “You can't be serious with that shot!" Those words, spoken by CBS’s Dan Bonner, have become synonymous with the Panthers’ second-round upset of the No. 1 seed Jayhawks in the 2010 NCAA tournament. They’re describing, of course, the three-pointer drained by instant hero Ali Farokhmanesh with 36 seconds remaining. 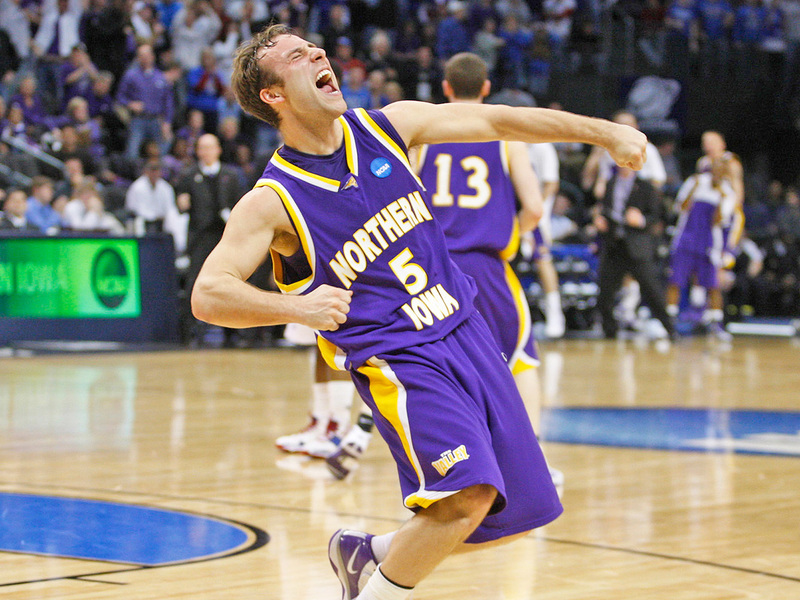 With Northern Iowa up only one, Farokhmanesh found himself wide open on the perimeter after an inbounds play. Rather than hold the ball and take time off the clock or attempt to drive on the lone Kansas defender within yards, Farokhmanesh coolly used the space to set himself and sink a game-altering trey—a gutsy decision that paved the way for the 69–67 upset. The loss was just the Jayhawks’ third all season and denied them a fourth straight Sweet 16 appearance. Instead, the No. 9 seed Panthers danced on to the lone trip to the third round in program history. You knew there had to be a Duke loss on this list. The Blue Devils have had multiple stunning first-round upsets in the last decade, but only one cracked our top 10. No. 14 seed Mercer’s upset win in 2014 actually had a lower probability of happening according to kenpom.com, but it’s No. 15 seed Lehigh’s 75–70 victory in 2012 that stuck out the most for our staff. That Duke team was led by freshman Austin Rivers, junior Seth Curry and the two older Plumlee brothers, Mason and Miles, while the Mountain Hawks were led by the Patriot League Player of the Year, a name that’s significantly more familiar to America nowadays than it was when he scored 30 on that day: C.J. McCollum. That upset probably never happens, however, if not also for the 17-point, eight-rebound effort by Lehigh’s Gabe Knutson, who shot a perfect 5-for-5 from the field to help his team land in the history books. The first (but not only) regular season game to make our list is another example of a four-letter acronym school putting itself on the map. This game might not have had the national spotlight of March, but that just made NJIT's 72–70 upset all the more unexpected. The Highlanders didn’t even belong to a conference at the time and were the lone independent team in the nation. They arrived in Ann Arbor with a 2–5 record, having lost twice to a UMass-Lowell team that finished the year outside the top 300 of kenpom.com’s rankings, and their best season since joining Division I had been a 16–13 campaign in 2012–13. To come to the Crisler Center and hand a program just two years removed from a trip to the national championship game a loss at home was monumental. The upset buoyed NJIT to a 21-win season under Jim Engles, and the school would join the Atlantic Sun Conference the following year. It may surprise you to learn that in terms of Vegas odds, No. 15 seed Norfolk State beating No. 2 seed Missouri, 86–84, was almost as big of an upset as UMBC over Virginia. 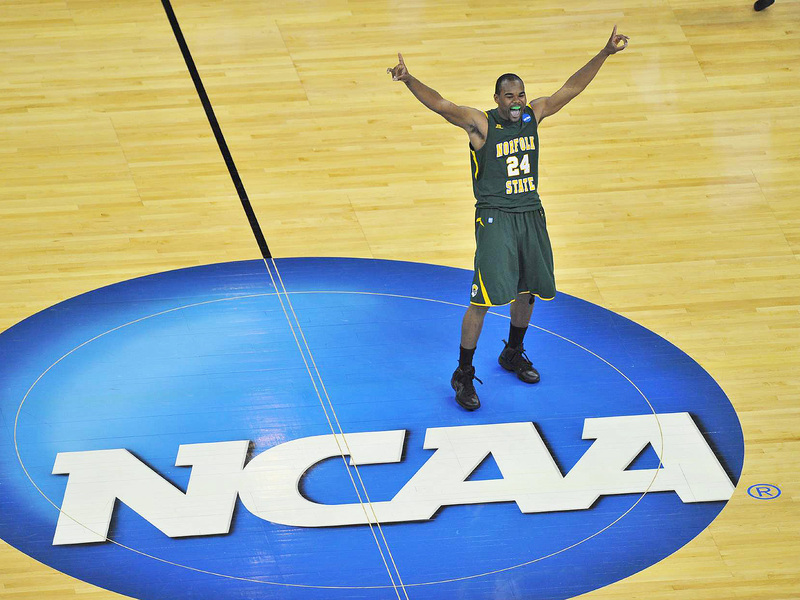 Before the Retrievers overcame being 22.5-point underdogs, the Spartans of Norfolk State owned the distinction of largest upset—betting-wise, at least—in NCAA tournament history, at 21.5 points. Part of the reasoning was the conference Norfolk State played in, as the MEAC historically ranks near the bottom of the mid-major pile. The Spartans were making their NCAA tournament debut against a Missouri team that won 30 games and finished second to Kansas in the Big 12. Unlike many March upsets, Missouri wasn’t felled by a bad shooting night—it went 52.7% from the floor and 44.8% from three. Led by future NBA player Kyle O'Quinn, Norfolk State simply one-upped the Tigers offensively, shooting 54.2% overall and 52.6% from three, while out-rebounding them 37–25. The Badgers are the lone victorious men’s team on this list that is not a mid-major, and a team that lost only four games all season may not scream underdog. But that’s what Wisconsin was when it took on a 38–0 Kentucky team in the 2015 Final Four, a team that was so good that it won its Sweet 16 matchup with West Virginia by 39 points and had future NBA star Devin Booker coming off the bench. Kenpom.com gave the Badgers just a 35% chance of winning, while FiveThirtyEight had the upset probability at 31%—despite the site’s model considering Wisconsin the nation’s second-best team behind UK. A rematch from the 2014 Final Four, the game pitted the country's top offense (Wisconsin) against its top defense (Kentucky), and in the end the offense won out, 71–64. The Badgers, led by senior forward Frank Kaminsky, made 51.6% of their twos and 41.2% of their threes, converted 18 of 22 free throws and won the rebound battle 34–22 to do what no one else in the country was able to do all season: beat Kentucky. A second non-NCAA tournament game rounds out our ranking, and it’s the second instance of a long UConn women’s streak ending. The Huskies had won 90 straight, at the time the longest streak in college basketball history … before they broke their own record six years later. The Cardinal have been a thorn in Connecticut’s side on more than one occasion—Stanford was the last team to beat the Huskies before the 90-game streak began and would later become the last team to beat them before their 111-game streak kicked off. 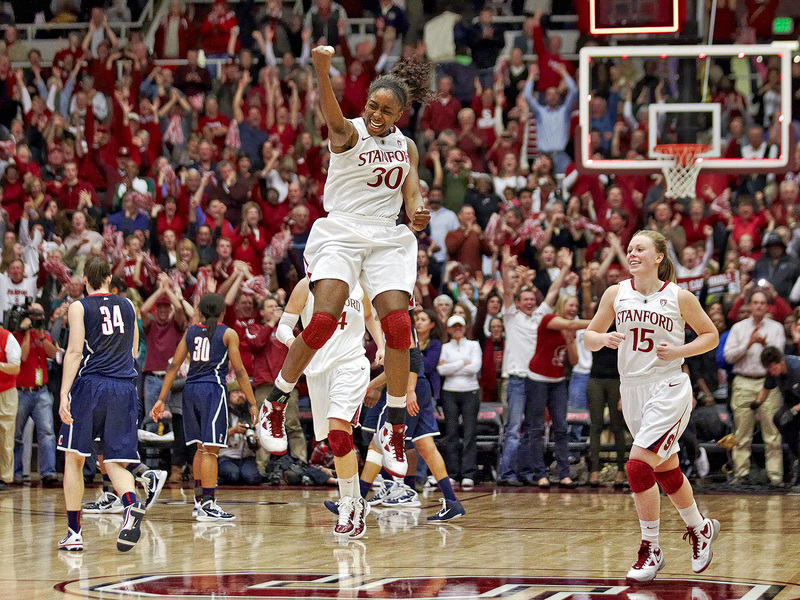 The visitors never even led in a 71–59 loss in front of a sellout crowd in Palo Alto, when Jeanette Pohlen poured in 31 points and Maya Moore was largely neutralized. “I’m not destroyed about it. Winning that many games in a row, it’s unheard of,” said Auriemma afterward. If only he knew what was coming.